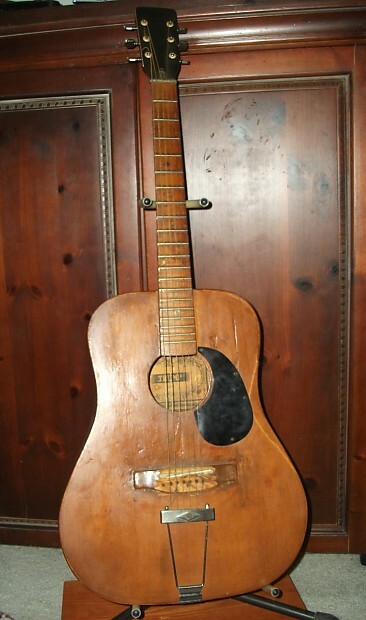 "there's a P-13 in the bridge (1940s pre-P-90 design, build is similar to the P-90 but without polepieces) and another late '40s thing from a National lap steel). The P-13 sounds amazing, as expected, but the National is a bit quiet in comparison despite it's size. 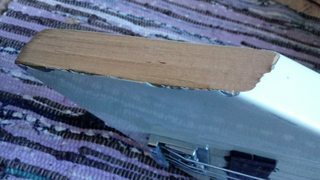 The gtr plays nice, neck is comfy and body light (plywoood); am liking the cutoff Tele style bridge too." 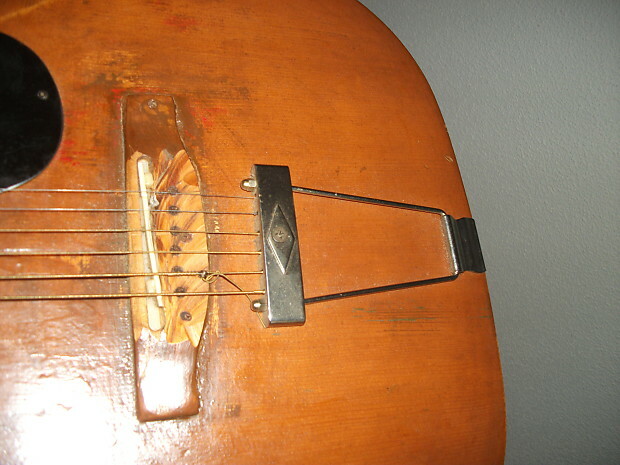 He mounted the National lap steel pickup the opposite of its usual orientation. 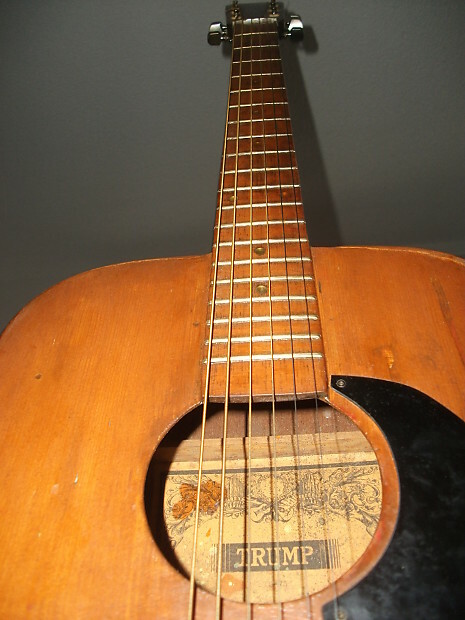 The part closest to the neck is where the strings normally would go. It was done well though. Neck has been refinished and the body has been also." Yes, of course, it was done at the factory. 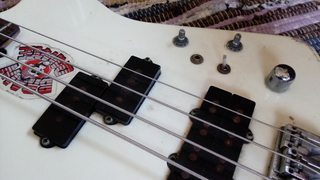 This bass has been in my closet for years and I want to do some bad amateur luthier things to it. What would you do? Gonna start with taking a door planer to the jagged edge so I don't cut myself but beyond that I dunno. My friend gave it to me in trade for a ticket to a DRI show that I was just going to give him anyway. Looks like it took a pretty bad spill. The electronics aren't working right now and I don't know what's salvageable. I've been meaning to collect some parts for it but so far all I've got is a bottle opener I'm going to mount on what's left of the rear wing. Please advise. OH my...I don't care what anyone says....that looks cool. Yeah, obviously, I have more than a passing interest in hack jobs. gnomethrone, what do you wanna get out of it? 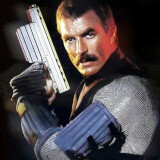 I'd like to save the bridge 'bucker if possible. Don't know how much you wanna spend. 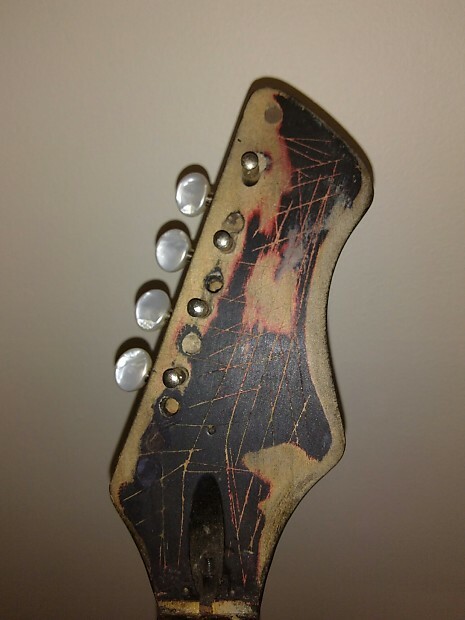 Maybe a mudbucker for the neck pickup though? Onboard fuzz'd be nice too. I'd definitely "shrink" that horn though. At least so it feels balanced. Strongly disagree with Chank...keep the horn. 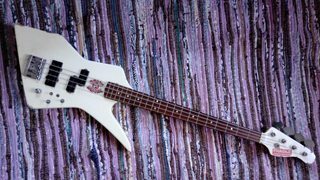 But to compromise...paint the bass purple. At some point this had a pin bridge. Chankgeez wrote: :erm: At some point this had a pin bridge. Why didn't they slap a Bigsby on it?